½ acre farmland is sufficient to produce all the food items required for everyday balanced diet except common salt. It includes vegetables, fruits, cereals, pulses, spices and oilseeds. Is it possible? Indeed yes! 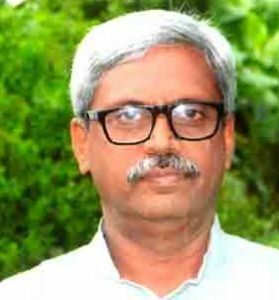 It can be attained through Annapurna Crop Model developed by Dr. D Pari Naidu, Executive Trustee, JATTU Trust (Justified Action and Training for Tribal Upliftment). Annapurna Crop Model was developed in 2012 with an aim to provide food security to a family of four plus the revenue of Rs. 50 thousand annually from ½ acre farm. In this model all food materials are cultivated that are needed in the everyday meals. We follow the slogan ‘My Crop My Food’. The model was first introduced in Vizianagaram district. Presently 3000+ farmers are practicing this model in the district and also people from other states like Jharkhand are replicating it. The project is supported by Government of Andhra Pradesh. 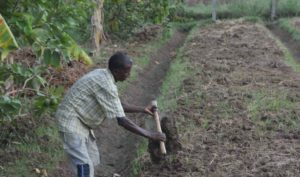 It is possible to produce food for the entire year in the farm having access of water for all 12 months. 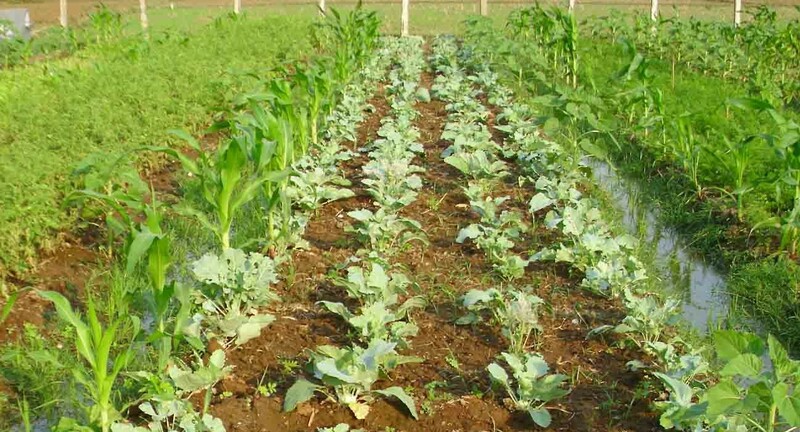 On the contrary in rain fed areas, crops can be grown in two seasons. The model can also be scaled to 1 acre. Desi cows are intrinsic part of this model as the plants are fed with its dung and urine based manure. Once the land is cleared and leveled, 1½ ft wide X 1 ft deep trenches are dug in the shape of ‘U’ around the farm edges. While digging the trenches, soil dug up to ½ ft depth should be put on the farm’s inner side. Remaining ½ ft soil should be put on the bund. 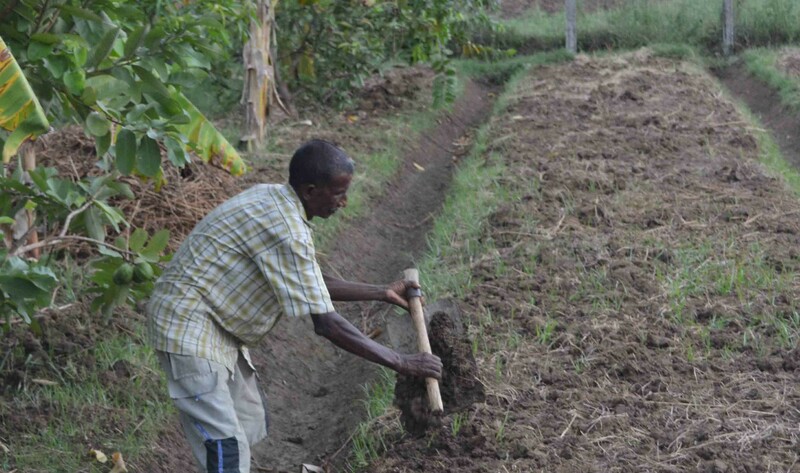 Trenches around bunds are useful for absorbing water that improves the ground water level. Next raised beds are prepared about 7 ft wide in the direction of East to West. In addition 2ft wide X 1 ft deep furrows are also dug in ‘V’ shape between the raised beds. 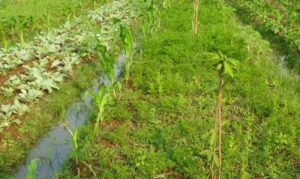 Soil on beds is made smooth spreading evenly by mixing any combination of natural fertilizers like farm yard manure, alluvial soil, vermicompost, tank silt, and poultry manure etc. (up to 6 inches) and spread evenly on the raised beds. Annapurna model even provides the provision to make farm pond (10 ft long, 6 ft wide and 4 ft deep) in a low lying corner of the field. It can be used in more than one ways such as to store excess rain water, grow fish, cultivate azolla for cattle etc. To begin with plantation, first fruit saplings are transplanted. Leaving 6 feet area from the bund trees with big canopy such as mango, amla, jamun or jackfruit are transplanted. 9 feet away from big canopy ones, small canopy trees are grown namely drumstick, banana, papaya, curry leaves. 18 feet away from big canopy ones, medium canopy trees are transplanted like guava, lemon, sapota, orange, custard apple etc. Next vegetables are grown on the raised beds. 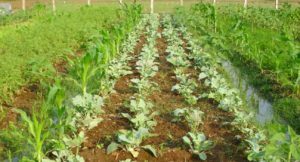 Tubers and leafy vegetables are sown in the allotted ¼ acre for vegetables, on those raised beds where fruit tree saplings are planted. Leafy vegetables on the 2nd raised bed while other vegetables lime, tomato, brinjal etc on 3rd and 4th raised beds. In the other ¼ acre, tubers and pulses that need shade are to be sown on those beds where fruit trees are already planted. 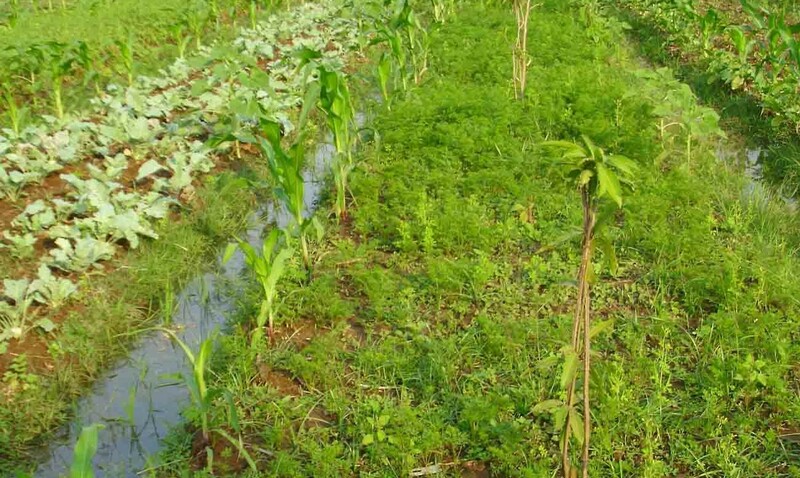 On those beds where no fruit trees are planted, millets like ragi, sorghum, pearl millets are sown or oil seeds like sesame, groundnuts or pulses like green gram, black gram, horse gram and cow peas etc are sown. Farmers can select crops as per their requirement. All seeds in the farm are sown after treating them with Beejamrutham. 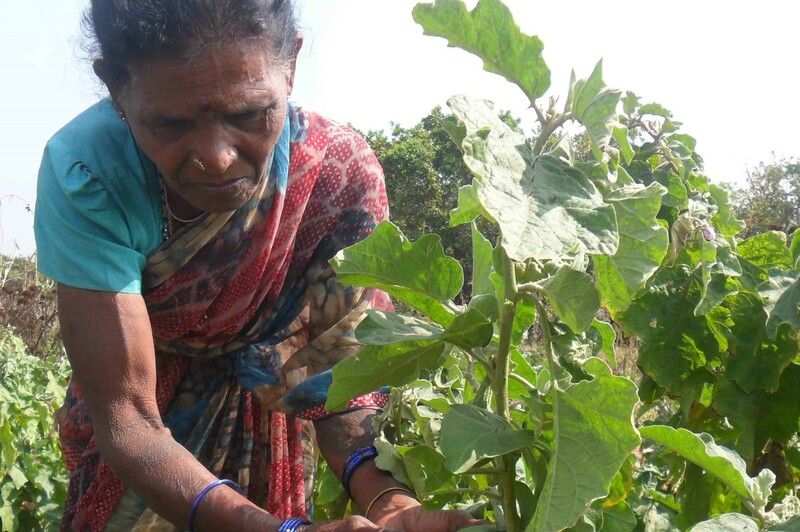 To safeguard the crops from diseases and pest, as a precaution, cow dung-urine solution and Neemastram is sprayed once in every 15 days. Alternatively trap crops can also be grown to protect the main crop. 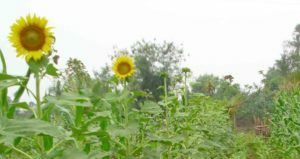 Marigold, castor, chrysanthemum, sunflower, onion, radish, okra (bhendi) are the trap crops grown either randomly or fixed pattern with the main crop. However in this model as multiple crops are grown the pest control is natural and easy. Weeding, irrigation and finally harvesting is done as per the regular schedule. Almost 99% of tribes have indigenous cattle and poultry so they can prepare all the farming inputs within the farm. Initially the seeds are sponsored by the Government and for the next cycle farmers save the seeds. Annapurna Crop Model leads to biodiversity and environmental balance. The model has been practiced throughout Vizianagaram district in the tribal area. The farmlands are rocky and have poor soil quality. Nonetheless the model comprises of growing multiple crops organically water required is minimum and slowly soil health is improving. We provide 3 days free-of-cost training to everyone who is interested in practicing the model. In three days, practical training is provided on Annapurna Crop model, chemical free agri inputs preparation, crop selection for intercrops, trap crops, irrigation management etc. In future I want more and more farmers in the every district of Andhra Pradesh and Telangana as well as other states to implement this model in their farm for food sustainability. Tribal community practicing this model is no more malnourished and is gaining good health that is the biggest achievement of this model. Another objective of my social endeavor is to propagate the importance of natural faming as well as enhance the production and consumption of poison free food for the future generations. Every living being on this planet earth has the right to consume nutritious food and Annapurna Crop Model is the way to it!